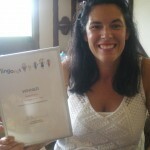 Teesside Lingotot Centre | French and Spanish classes for kids. MFL PPA cover. My name is Abigail and I am a married mum of 2 boys (8 and 6 years old). My grandfather was French and I always regret that I can't speak French fluently. I wanted a class for my boys that would teach them a foreign language while they were very young as I'd read a lot of information on how very young children can pick up a foreign language easily. I researched on the internet and came across Lingotot. Unfortunately the closest class to me was Durham and I live in Hartlepool, so I started taking my boys to the Durham classes. My boys really enjoyed the classes and I was so impressed I decided to get the franchise for the Teesside Area. All of the sessions are conducted almost entirely in the target language and you learn with your children. We offer plenty of support for mums, dads and grandmas so you can continue your family's language learning journey at home.